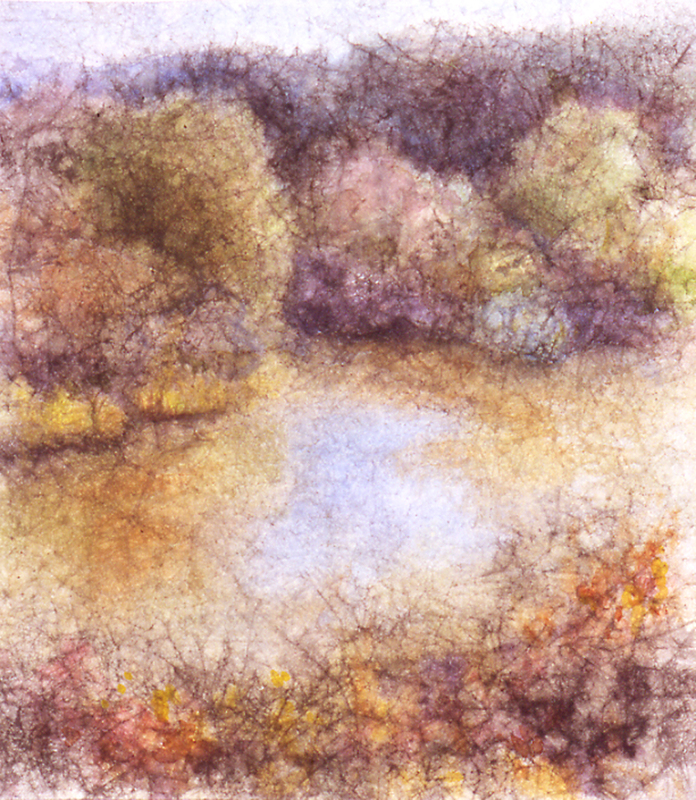 This workshop will explore the crinkled masa paper painting technique. This enjoyable class combines Asian and Western painting techniques, and uses Japanese sumi ink and watercolor on Japanese paper. Each person will learn the techniques for crinkling the masa paper, which will produce intriguing textures, introduce the element of chance, and is very fun, as well. By the end of the workshop, everyone will go home with at least one finished artwork, and the knowledge to make more. The instructor, Sheila Sondik, has explored this method of working for many years. See beautiful examples of her experience with the medium on her website at www.SheilaSondik.com/paintings.html. The workshop instructor at the helm of her studio. Sheila Sondik is a prolific artist whose works have been exhibited in many states and in South Korea and Japan. 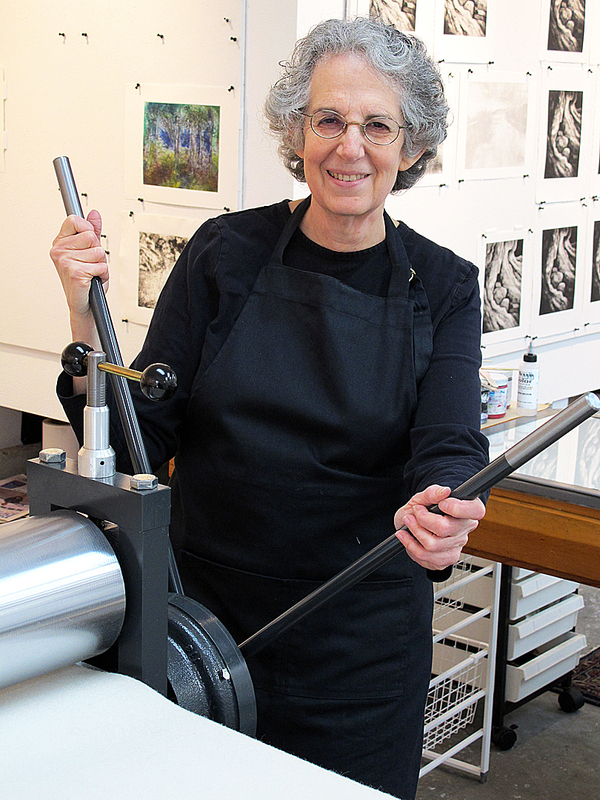 She has taught individuals and groups in Berkeley, California, and in her Bellingham printmaking studio. Sheila is currently working on a series of prints inspired by Chuckanut sandstone. For more information, visit her website at SheilaSondik.com. Saturday, January 21, and Sunday, January 22, from 1 to 5 both days. Materials list will be distributed to registrants. Most materials will be provided, and are included in the registration fee. Workshop is limited to eight participants. Sheila Sondik, 1809 Summit St., Bellingham, WA 98229. Until December 24 at 8 pm, you can visit The Mill (205 Chestnut St., Bellingham) to purchase presents you won’t hardly find anywhere else. Original art, honey, handmade apparel, and of course, Bison’s fantastically beautiful and often humorous letterpress cards and books. This year, you’ll find everything on your list: from honey to journals, baby hats to greeting cards, tie-dyed vests to cookies. It’s worth the time stopping in even if the only thing you see is the etching press, imported from Paris, and moved across the country to Kevin and Carly’s shop. Or would that be Shoppe? The bright yellow walls will keep winter’s depression at bay. Egress Studio Press has a few things there, too: greeting cards, prints, poetry and little handsewn, illustrated journals. Uploading this has taken so long that I can only say I have to quit. Jim and I are getting high speed real soon, supposedly. If we do, I’ll update this again. Jim says I ought to show what Egress Studio has at The Mill, and I want to share photos of Carly’s dad Dave and Jim, as well as Robert Sarazin Blake’s actual records (i.e. LP’s) and CD’s, and it only took an additional forty-five minutes to add them to the slide show. I’m giving up now, at Jim’s request.